A productivity suite covers all of your basic needs such as email, calendar, documents and shared file storage and is the core of all the business apps on the cloud. There are two major players in this space: Google Apps and Microsoft Office 365. While we might all have our current preferences and lean towards Google or Microsoft for our products, bear with me here because it’s not so crystal clear. If you have never used one of these two tools before, you’re in for a pleasant surprise. In this article, I’m going to compare Google Apps vs Microsoft Office 365 to show you which is the best suite of tools for your business and personal productivity. Whether you choose Google Apps or Office 365, you’ll get a simple control panel to manage everyone in your business, allowing you create and delete users. Each user will get their own email address @yourcompany.com, their own calendar, a folder on the cloud storage drive and access to an office suite to manage documents, spreadsheets, powerpoint presentations and et cetera. Everything will be synced to the cloud securely, accessible by any browser or mobile device with zero IT maintenance required. The beauty of cloud computing is that everything is hosted and run by the provider — all you need to do is create an account and login, and any server issues aren’t your job to fix! There are numerous mobile apps, both made directly by the provider or by 3rd party developers allowing you to access email, calendar, documents and more. For official Google apps, you’ve got Gmail or Inbox, and for Microsoft you’ve got Outlook. There are, of course, many more different email clients for both Google users and Microsoft users. If you’ve ever messed around trying to set this kind of environment on site without a cloud network, you will know the headaches that come with it. IT administration and support staff, server rooms, 20 different licenses and a load of frustration. Do yourself a favor and move your office productivity suite to the cloud. Now you’ve decided to move to the cloud, what provider are you going to go with? The answer to that really comes down to your business and personal preference. Google Apps — Slightly cheaper, less complex, less advanced features. 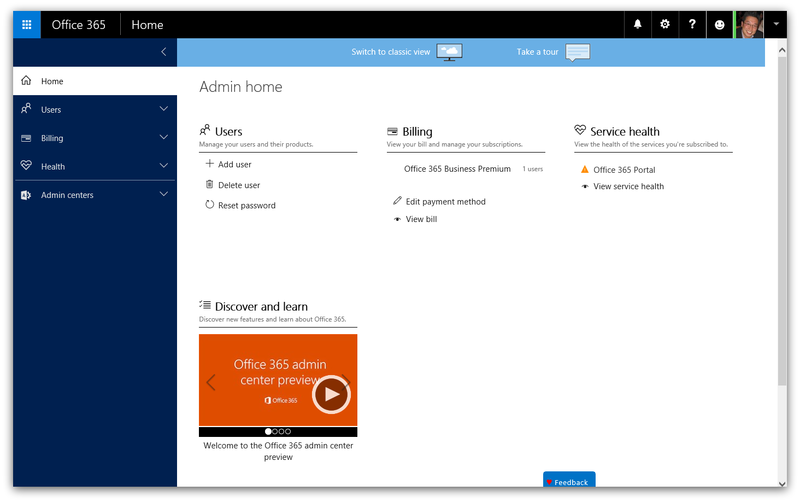 Microsoft Office 365 — More expensive, more features, option for desktop apps. …Not satisfied? I’m going to go into a full comparison of the two platforms and compare them bit by bit. 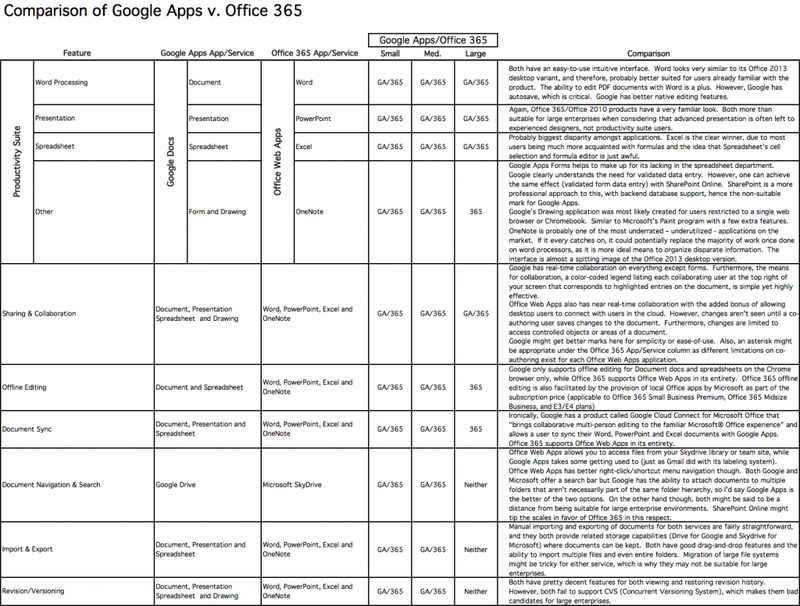 What’s Included in Google Apps and Office 365? Honestly, if you wanted to make a spreadsheet, upload it to cloud storage then share that link with a friend, you could do it with either suite. Both suites feature roughly the same tools, so it’s all in the details. Here’s what they each provide. If you choose to go with the special package, you also get Vault. Vault is “an add-on for Google Apps that lets you retain, archive, search, and export your organization’s email and chat messages”. This is useful for generally re-discovering old information, or if your regulations need you to keep this data to stay compliant. 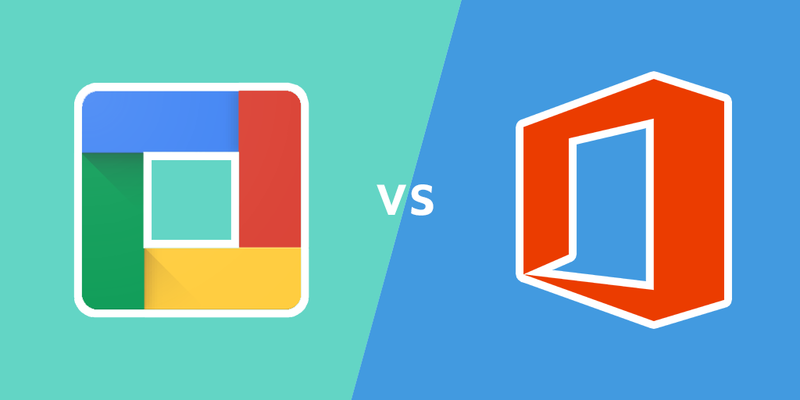 Google Apps vs Microsoft Office 365: Which Suite Provides the Best Tools? Both suites have tools for documents, spreadsheets, presentations, email and video calls included, but Microsoft beats Google Apps when it comes to its database tool Access and note-taking tool OneNote — you’ve just got to ask yourself whether these two tools are vital or not, and whether the rest of the suite matches up. It is a fact that Microsoft Excel is more powerful than Google Sheets, but whether you’re going to be using VBA scripts and the billions of add-ons is another question entirely. Does your business have spreadsheet power users in it? You’re going to need Excel. The same goes for Outlook. While it’s definitely not as progressive as Gmail, it’s an old stalwart and that means that there’s a lot of support going around for it. It also means that it can do many things Gmail can’t. In short, if you need the power user features in your email and spreadsheets, a safer bet is Office 365. If you prefer usability, then go for Google Apps because Microsoft doesn’t put much design time into usability (either that, or they’re just awful at it). Choose Google Apps if you’d rather pay half the price for a service which is updated more regularly, is more user friendly and has tools that are likely to overtake Microsoft’s sluggish alternatives in the future. Google is quickly outpacing Microsoft, who would only be a viable choice here if you need some niche Office-only features. In 90% of cases, Google Apps is a better choice. Personally I use a combination of the two because I need some of the features that are currently only available with Office products. What do you think? Do you use Google Apps or Office 365?